Its been a while since I had an ambulance photo here so try7 this one for something a little different. 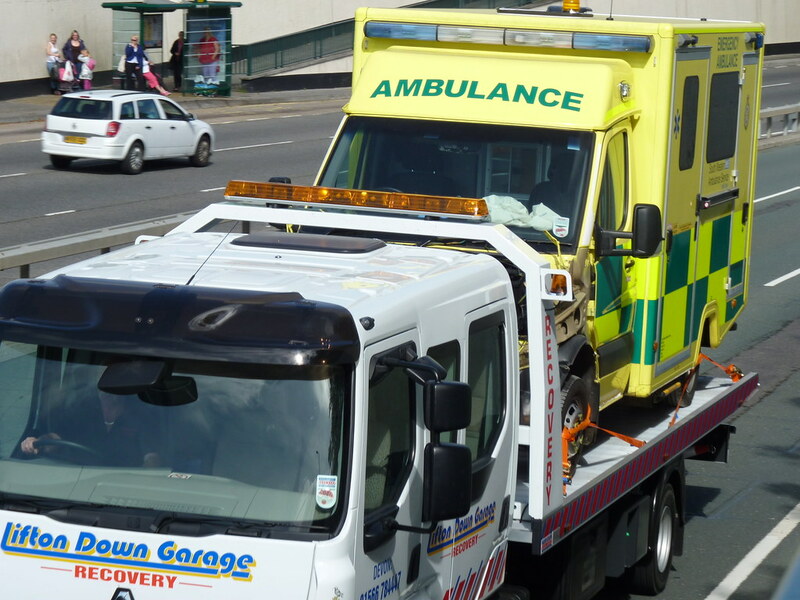 An unidentified but fairly new ambulance is carted off on the back of a truck. I didnt have time to get a better photo so I cant tell which ambulance it was but it did seem quite bady damaged. News: Sir Moir Lockhead, chief executive of Aberdeen-based FirstGroup, will retire in March from the rail and bus company he created out of Grampian Regional Transport. Ah one of the mercs. This is a new one which had been delivered to Derriford to be despatched elsewhere in SWAST NHS Trust. These really are good vehicles and we enjoy driving them compared to our old renaults. Problem is they are a bit too wide for the countrylanes we have to go down. The '09' plate series onwards appear to have been fitted with amber roof beacons (airport warning lights? )so I suppose it might be one of those instead of a '10' series registration unless, of course, there are '59' or even 60' registrations in the fleet. Such a vast geographical area over which the vehicles are distributed it is difficult to know who has what or whether badly damaged ambulances all come back to Plymouth or go for more local repair, ie Bridgwater or Penzance? Would anyone know please? Looking through other photos is clearly one of the 09 or newer batches. VX09FYP is a Plymouth based ambulance but I am sure I have seen this one today. There has been a 60 ambulance at Derriford base this week but I couldnt get close enough to view the reg. It wasnt there today when I passed by the Station. Derriford ambulance station certify all the new ambulances upon entry into service! Derriford ambulance stn has no 10 plate mercs they are going to Cornwall. Derriford ambulance station maintain the mercs and renaults for Plymouth, South Devon and South East Cornwall stretching to Liskeard. I hope this helps I work on them! Thanks for the confirmation anon. I knew I often saw new ambulances at Derriford which then disappeared elsewhere. I really must start taking better notes as I walk past.